In each of the past three years, the value of U.S. energy exports to Mexico has exceeded the value of U.S. energy imports from Mexico. 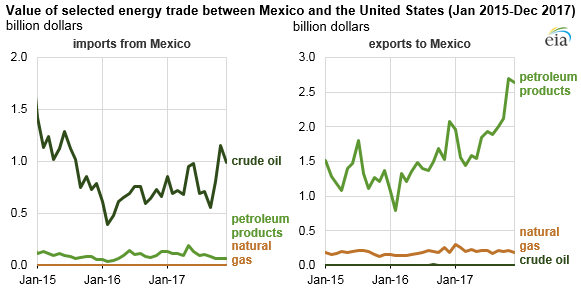 Energy trade between Mexico and the United States has historically been driven by Mexico’s sales of crude oil to the United States and by U.S. exports of refined petroleum products to Mexico. As the United States has reduced crude oil imports from Mexico, the trade balance has shifted. Through 2014, Mexico’s exports of crude oil to the United States were the most valuable component of bilateral energy trade, with the overall value of Mexico’s U.S. crude oil sales far exceeding the value of U.S. net sales of petroleum products, primarily gasoline and diesel fuel, according to data from the U.S. Census Bureau. 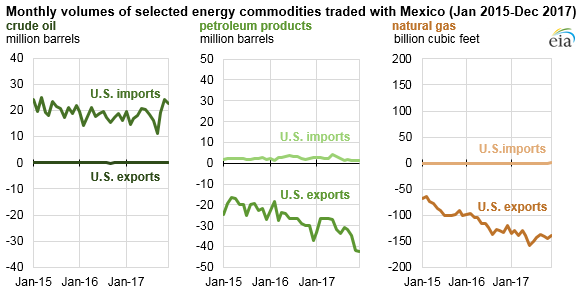 Starting in 2015, the value of U.S. energy exports to Mexico, including rapidly growing volumes of both petroleum products and natural gas, exceeded the value of U.S. energy imports from Mexico as volumes of Mexican crude oil sold in the United States continued to decline. The value of U.S. energy exports to Mexico increased to a high of $25.8 billion in 2017, including $23.2 billion of petroleum products. Overall, this export value was more than twice as much as the $11.1 billion value of 2017 U.S. energy imports from Mexico. Based on the latest annual data from the U.S. Census Bureau, energy accounted for more than 10% of the value for all U.S. exports to Mexico and 4% of all U.S. imports from Mexico in 2017. Crude oil makes up most of the U.S. energy imports from Mexico, averaging 608,000 barrels per day (b/d) in 2017. In 2017, Mexico was the source of 8% of U.S. imported crude oil, the fourth-largest share behind Canada, Saudi Arabia, and Venezuela. From 2007 to 2015, these crude oil imports were valued at an annual average of about $30 billion dollars, but more recently, because both U.S. crude oil imports and world oil prices have been relatively low, these imports from Mexico were valued at $7.6 billion in 2016 and $9.8 billion in 2017. As Mexico’s crude oil exports to the United States have fallen, Mexico has been sending more oil to countries in Europe and Asia. Petroleum products such as finished motor gasoline, distillate fuel oil, and propane account for most of the value of energy exports from the United States to Mexico. In 2017, Mexico was the destination for more than 1 million b/d of petroleum products, up from 880,000 b/d in 2016. This level was 24% of all petroleum products exported from the United States. These exports were valued at more than $23 billion dollars in 2017. In 2017, petroleum product exports to Mexico rose in both amount and value. Changes in Mexico’s utilization of petroleum refineries have created a widening gap between its domestic supply and demand, and U.S. gasoline exports now make up more than half of Mexico’s gasoline consumption. Compared with petroleum product exports, petroleum product imports from Mexico to the United States are relatively small, making up about 74,000 b/d with a value of $1.2 billion in 2017. Natural gas exports to Mexico from the United States—either shipments by pipeline or liquefied natural gas (LNG) cargoes—were 4.6 billion cubic feet per day (Bcf/d) in 2017. This natural gas trade is dominated by pipeline shipments to Mexico, which made up about half of total U.S. natural gas exports in 2017. Increasing shipments of natural gas by pipeline to Mexico are contributing to the United States’ emerging status as a net natural gas exporter. Natural gas pipelines currently under construction or in planning stages are expected to nearly double the pipeline natural gas exporting capacity from the United States to Mexico by 2018. Much of this natural gas will likely be used to generate electricity, as Mexico’s energy ministry expects to add significant natural gas-fired electricity generating capacity through 2029. LNG export operations began at the Sabine Pass facility in Louisiana in February 2016. From February 2016 through December 2017, U.S. LNG exports to Mexico totaled 168 Bcf, or 19% of U.S. LNG exports, making Mexico the largest destination for U.S. LNG exports.